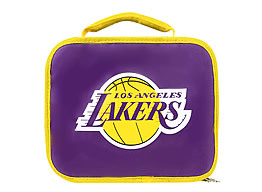 Soft sided vinyl/plastic insulated lunchbox. Zipper closure. Material carry handle on top. Includes removable center divider that's great for separating your sandwich from your beverage or your lunch from your snacks. Divider attaches securely via velcro on 3 sides (top, bottom, and back). Approximate dimensions: 10" wide x 8" high x 4" deep. This is an officially licensed NBA product.